This offer can be used when dining from the a la carte menu and cannot be used in conjunction with any other offers. Please note service charge will be added to your bill and party size is subject to availability. You will be allocated two hours to your table. The creation of Italian brothers Gabriel and Marcello Bernardi, Italian restaurant Bernardi's takes inspiration from the Italian restaurant scene in Melbourne during the nineties and noughties. The result is a sleek décor - the marble bar is certainly Instagram worthy - and hearty, modern Italian dishes. Think pea and pecorino soup; mushroom, gorgonzola and aged balsamic pizzette; smoked salmon, fennel, beetroot and olive salad; and even Italian Sunday roast with porchetta or poussin. For a cocktail, head down to their basement bar The Dog House. Bernardi's gyms, sporting activities, health & beauty and fitness. The best pubs near London Bernardi's. Bernardi's clubs, bars, cabaret nights, casinos and interesting nightlife. 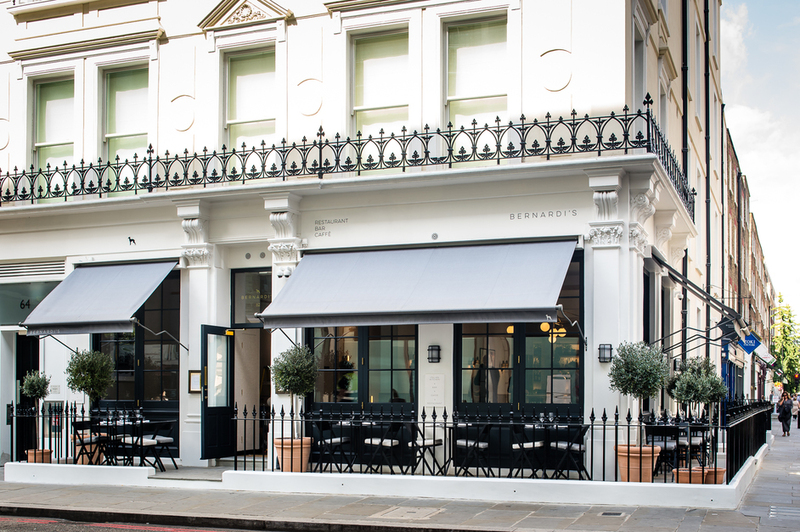 Where to have your meeting, conference, exhibition, private dining or training course near Bernardi's. From cheap budget hotels to luxury 5 star suites see our discounts for Bernardi's hotels, including Hyatt Regency London The Churchill from 94% off.